Daniel Dye performs with Zach Whitney. Bill Purk of The Muleskinners leads a workshop. Daniel Dye & the Miller Road Band perform on stage. 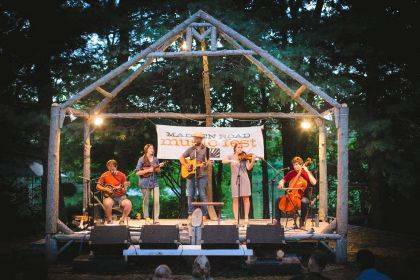 MUTUAL – The annual Madden Road Music Fest takes place on Saturday, Aug. 11, from 2 to 11 p.m. on the old Madden Farm in Mutual. 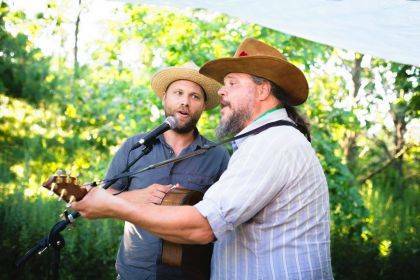 Madden Farm has been in the same family for seven generations and serves as the venue for the family’s micro music festival. Local singer-songwriter Daniel Dye hosts the festival along with his nieces and nephews, Andrew, Thomas, Carrie and Emilie Miller, who play locally as the Miller Road Band. The band features Dye’s original tunes using a mix of classical and folk instruments. Daniel Dye & the Miller Road Band take the stage for an 8 p.m. performance. Musicians based in central Ohio and beyond will take the stage with a mix of indie, folk, gospel, rock and Americana roots music. The American Landscape is featured on the Pine Stage, along with local favorites The Muleskinner Band and festival hosts Daniel Dye and the Miller Road Band. Columbus swing and jazz band the Whirlybirds will close out the festival with a rousing set. New to the festival is the In-the-Field Stage, featuring intimate acoustic acts Out of the Pine and OldNews, from Columbus and Dayton, respectively. Out of the Pine offers rich instrumentation and tight vocals, and OldNews is a band full of surprises, with a rotating collective of performers offering a fluid performance style that emphasizes traditional instruments with a contemporary interpretation. The intimate Black Locust stage features a roster of rock and indie folk, with Poptek Records founder Andy Ingram performing as XL427. Fest newcomers Jason Ropp, Shiloh Hawkins, and Lou Fran, singer-songwriters hailing from central Ohio, Kentucky and Indiana, perform original work. Festival favorites the Kurtz family are returning to the stage, along with Starving in the Belly of the Whale, both acts offering moody, immersive experiences. The Zach Whitney Show is also returning, showcasing Whitney’s powerful vocals and energetic style. The annual Madden Road Music Fest singalong closes out the evening from the Pine Stage. A few pop-up acoustic performances from the extended Dye family will take place as well as an expanded lineup of interactive workshops. Basic folk dancing, a workshop with musician Paul Race, the History of Bluegrass with Bill Purk and more are scheduled. 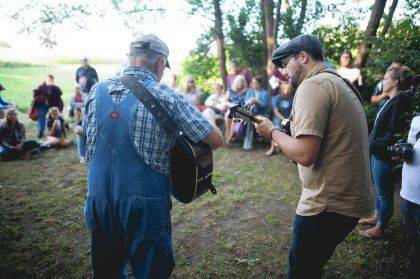 Walking trails on the farm, singing around the campfire, and painting a communal mural to commemorate the 2018 event are all part of the Madden Road Music Fest. Local favorites Hemisphere Coffee Roasters, Hippie & the Farmer, Taco Hiro, and the Madden Farm Food Stand will all be providing fresh, locally-sourced food ranging from specialty coffee, salads, smoked turkey sliders, hamburgers, ribs, tacos and more. Submitted by the Daniel Dye family.